This course will introduce you to an approach you can use to determine electric power requirements for buildings and multi-building developments and activities. You will learn about terminology, and acquisition and analysis of preliminary load data you will need. You will learn how to estimate individual loads, emergency loads, area loads, and loads for entire developments and activities. You will learn about basic considerations for power sources and considerations when purchasing primary electric power from a utility. You will also be introduced to considerations when customer-generated emergency and uninterruptible power is required for certain activities. Learn how to convert motor horsepower to input kilovolt-amperes for preliminary estimates. Learn the definition of Demand Factor and how it is used to determine power requirements. Learn the definition of Coincidence Factor and how it is used to determine power requirements. Learn the definition of Diversity Factor and how it is used to determine power requirements. Learn the definition of Load Factor and how it is used to determine power requirements. Learn recommended Demand and Load Factors for a wide variety of buildings and activities. Learn how to quickly estimate lighting power requirements from illumination levels for various areas. Learn guidelines for selection of Demand Factors. Learn guidelines for selection of Load Factors. Learn about the three types of emergency power loads. This course is intended for all of the engineers, architects and construction professionals who are members of the building and infrastructure design and construction team. 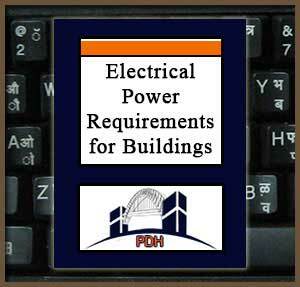 It will give non-electrical engineers an introduction to the issues the electrical engineers on the design team deal with in estimating electric power requirements for buildings, developments and activities. And it will give electrical engineers who have limited experience with building design an introduction to electric load estimating methodology.Building designers and construction professionals will gain an understanding from this course of the terminology and methods used to estimate electric power requirements for buildings and multi-building developments and activities. This course is a poorly reiterated version of an outdated version of the Unified Facilities Criteria (DoD). There is very little information that applies to civilian power distribution design.